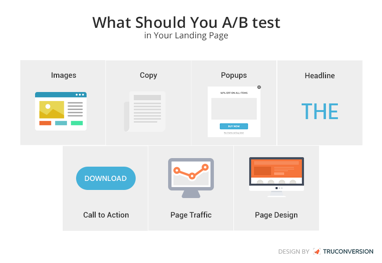 What Should You AB Test on Your Landing Pages? 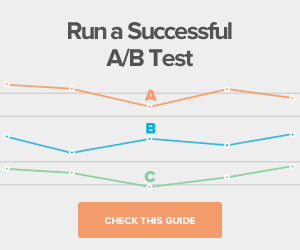 What Should You A/B Test on Your Landing Pages? So, you’ve already invested a considerable amount of time, money and resources on developing a fully-functional and navigable site. What next? We’re sure you plan to set a budget for PPC ads, social media and email marketing in order to drive traffic to your site. Great! But what happens when a visitor clicks on your PPC ads or links on your social media profile? If they land on the company’s homepage, you’ve already failed! Remember, you don’t just need to drive leads to your site; you also need to convert them. 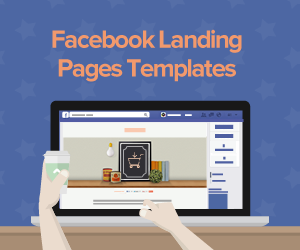 This is where landing pages come to your rescue. They help you convert your web traffic into qualified leads. 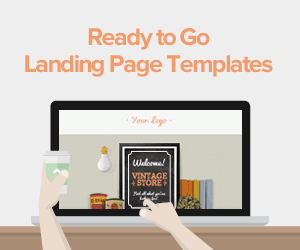 We’re sure now you understand that you need to create a landing page. 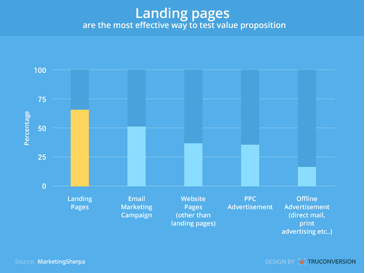 In fact, a Marketing Sherpa survey of 1,915 marketers found that for 64% marketers, landing pages are the most effective way to test value proposition. 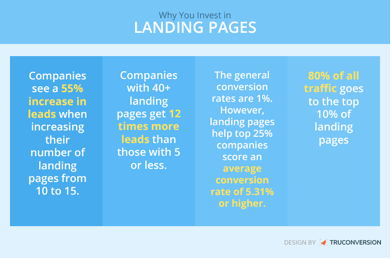 Why Should You A/B Test Your Landing Page? Ok, now you understand the importance of a landing page. But you’ve just eight seconds to grab the attention of your visitors, according to Telegraph. So how will you make sure that you’ve created a page that your visitors will love right from the get go? 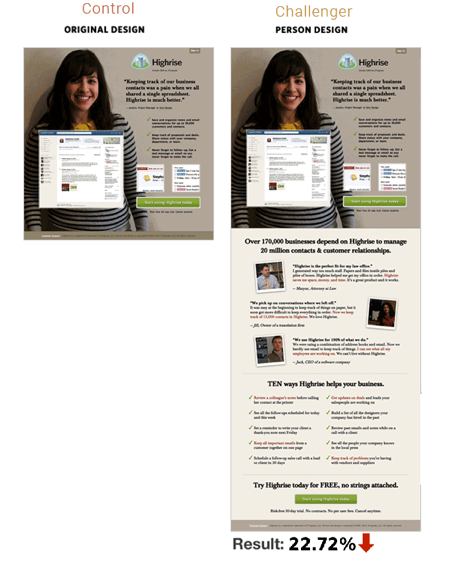 Of course, you’ll need to A/B test your landing page. What Should You A/B test in Your Landing Page? 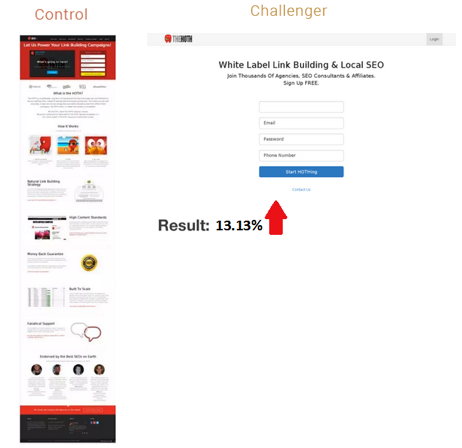 Without further do, let’s get started and understand how to A/B test these landing page elements to generate more leads and customers. The one thing that influences the visual appeal of your landing page is your selection of images. Image play three critical roles on a landing page – conveying a mood, supporting the text and building consumer trust. Studies and researches reveal that adding picture of a customer at your landing page adds to the trustworthiness of your brand and strengthen customer-site relation. In fact, it wouldn’t be an exaggeration to say that adding customer photos on your landing pages helps you increase conversion rates. Let’s check the example of 37Signals. After doing many tests, the company decided to cut through the clutter and add a picture of a customer to its ‘Highrise’ product landing page. Resultantly, they were able to increase their sign ups by 102.5%. Select Landing Page images that have a clear connection with your brand. Add picture of customers instead of generic images to increase trustworthiness of your landing page. Ensure all your landing page elements are in a clutter-free space. The content on your landing page is referred to as the copy. It directs your visitor to take the desired action on your landing page. 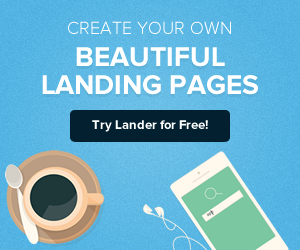 So, how should be an ideal landing page copy? Longer or shorter copy? Action-oriented or comfort oriented? Ideally, your landing page copy must be action-oriented and shorter. But you must ensure that your copy is simple, and easy-to-understand. It must be laid out in a way that vital information pops up. The tone, words and the overall voice of your content must make your visitors want to know more about your brand, want to stay. Let’s take the example of 37Signals again. After testing their landing page image, they decided to test the copy length. They tested a long page containing the background image of a customer against a shorter version of it and they found out that the longer version decreased their signups by 22.72%. Take a look. Ensure shorter, comprehensible and easy to understand landing page copy. Make your landing page copy action-oriented aimed at solving customer problems. Ensure that your landing page copy is able to convey your unique value proposition to your visitors. First things first! What’s a pop up? Also called a Modal Window, it’s a window that pops up by certain triggers and guides your visitors to complete a certain action. Think pop ups are annoying and frustrating? Studies reveal that pop ups increase email subscribers by 1000% within a month if used properly. If perfecting your landing page for conversion is your concern, pop ups definitely are your best friends. But pop ups are not a set-and-forget element. You’ll need to keep testing your pop ups to maximize your conversions. Don’t use more than 2 pop-ups on your landing page and avoid huge pop-ups. Keep your pop-forms short and crisp. Take a clue from the example; do well to ask just the username and password. Ensure that your pop-up form doesn’t slow down your landing pages’ load time. Headlines are one of the most vital elements of a landing page. Remember, headline is the first thing that a visitor reads on your landing page. And basis your headline they decide whether to stay on your landing page or close it. No wonder, it often spells the difference between success and failure for your landing page. A bad headline can kill your conversion and make all your efforts, time and money invested on your landing page go down the drain. That’s it’s important to A/B test your landing page headline. Let’s take another example of L’Axelle, German underarm Sweat Pads Company. They tested their landing page headline. 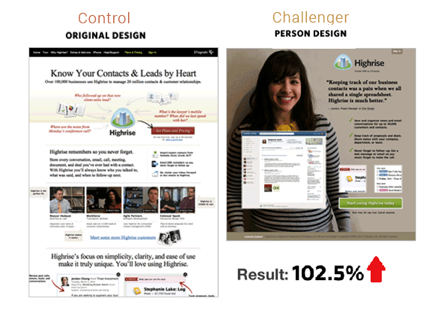 The headline in their original landing page was comfort oriented, whereas their challenger headline was action-oriented. The action-oriented headline earned them 38.3% conversion rate, which was 93% better than their original version. Use a powerful headline. Keep it simple. Your headline must be short (under 20 words), specific and sassy! Make sure your headline is action-oriented and focused on how your offer can solve customer’s problems. Just designing a creative, unique and professional landing page design doesn’t guarantee conversions. You’ll need to guide your users to take the desired action on your landing page. This is where Call to Action buttons come to your rescue. Your call to action button spells the difference between bounce and conversion. So, it’s essential to ensure a powerful and conversion oriented Call to Action button at your landing page. But it’s not as simple as it sounds. Fortunately, you’ve an option to A/B test your Call to Action buttons to ensure that your Call to Action button to turn visitors into leads. Let’s discuss the popular example of Nature Air. 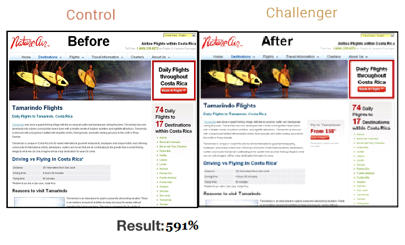 The Costa Rican Airline tested the call to action button at its landing page. They created a landing page with contextual CTA and tested it against their original landing page. Resultantly, their conversions improved by 591%! Select colors that make your call to action buttons visually pleasing and make them stand out. But ensure that the color doesn’t clash with the background. Ensure bigger call to action buttons and place them prominently. Avoid placing your CTAs on sidebars and under the fold. Don’t be afraid to be creative with your call to action buttons. Try to make it action-oriented. Even if you’ve designed the best landing page in the world, it’s of no use if it isn’t able to drive traffic. And yes, you don’t just need any traffic; you need the right traffic to boost conversions. Let’s take the example of Shirtinator, Europe’s leading customized merchandise provider. They had a mobile and desktop version of their website. Traffic coming from tablet was routed to the mobile site landing page. But the mobile site wasn’t well optimized for tablet users. This lead to a decrease in the conversion rate despite the substantial web traffic. The company decided to A/B test the traffic coming only from android-based tablets. They segmented their users in 2 groups– one for mobile site and another for new, HTML5-based desktop version well optimized for tablet users. The result was that the new HTML5-based website worked better than the mobile web for tablet users and increased the revenue by 71.81%. Take a look. Analyze your traffic sources and ensure consistent user experience across all devices and platforms. Use traffic and user segmentation to best optimize your landing page for increasing traffic. Ensure easy navigation and functionality. Don’t go for a full-scale website experience on your landing pages. Your landing page design can take elements of your brand and showcase those elements to the world in a way that’s even more awesome. And because it’s so awesome, your target audience will have absolutely no choice but to complete the conversion process. But creating a landing page that can summon apt attention and interest from your target audience is no mean feat. In fact, you’re faced with a barrage of questions such as should you ensure a graphic heavy design or minimalistic one? Should it be product centric or user centric? The best way to make a well-informed decision about your landing page design is by running A/B test experiments. Here, we present to you the example of The HOTH. This white label SEO Company wanted to increase the number of subscribers. Their traffic was considerably good but the conversions were fairly lower. So, they A/B tested their rather cluttered and graphic-heavy design against a minimal page design eliminating everything but the sign-up form. The results were rather fantastic. The minimalist page design took subscriptions from 1.39% to 13.13%. Avoid visual clutter. Try to keep design minimal and make sure the images that you’re using on your landing page are light-weighted. Take care of proper formatting. It provides visual-friendly user experiences to guide visitors to complete the conversion process. Be consistent with your design and navigation in your landing page design. Also add social proof to your landing pages to add to its credibility and trustworthiness. If you’re really looking forward to turn your landing page into a high conversion machine, you’ll need to keep testing. Remember, there is no one-size-fits-all technique, but we’re sure these 7 elements will surely help you point in the right direction. Try testing one element at a time and we’re sure you will see a sizeable increase in your conversion rates. After you get successful in driving visitors to your landing page, you’ll need to make that extra push to realize your conversion goals. You’ll need to create a monthly calendar of landing page elements that you’ll want to A/B test and optimize on a regular basis. After all, it’s your business and you wouldn’t want to take any risk. Daniel is the Chief Marketing Officer at TruConversion.com Experience with both startups and enterprise clients have given him unique perspective and ability to connect the dots for brands of all sizes. 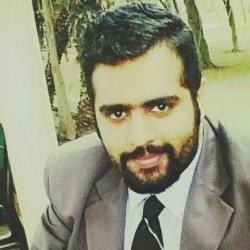 He loves writing on content strategy, marketing, and optimization initiatives.